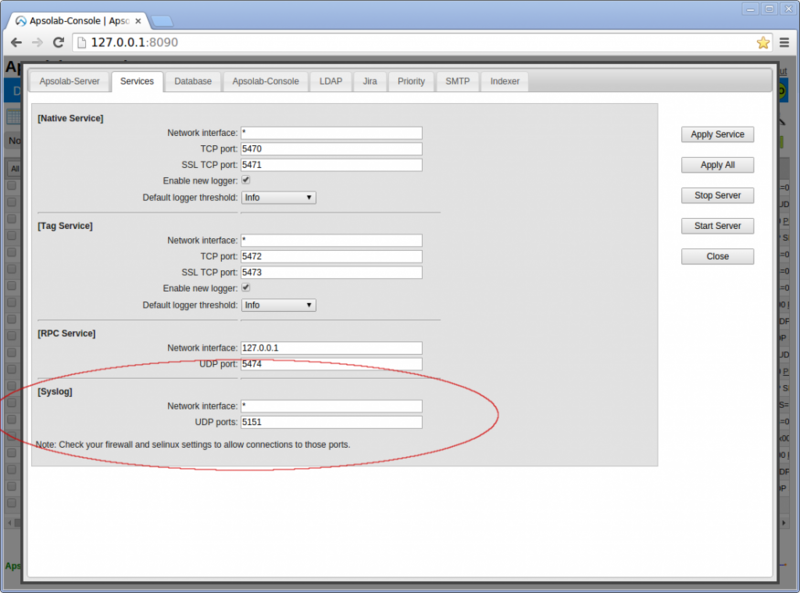 This article explain how to forward logs from router, switch, firewall or any other telecom device to Apsolab-Server. To forward logs from telecom devices to Apsolab-Server, your device must be able to send logs in syslog format to external host. In short, it must be compatible with syslog protocol. If you don’t have any special needs like extracting fields from syslog message or saving message in external file, just forward you device logs to Apsolab-Server. This is explained in scenario #1. To save a copy of logs in external file or to extract fields (special parsing) or if your device is not compatible with syslog UDP, refer to scenario #2. Now, configure your device to forward logs to UDP port you just entered in the Services window. Don’t forget to enable those ports in local Apsolab server firewall and selinux. For our example, we will configure one router and two switch to forward logs to server 10.1.1.128 running syslog-ng. This server also run Apsolab-Server and accept connections from XLog-Agent on port 5470. In this scenario, each devices will connect with Apsolab-Server with there own logger. With this setup, you will see 3 loggers in Apsolab-Console. One for each device. This will allow you to control each log source. It’s also easier to set filters and alarms with this setup. Note: If your devices support TCP, we recommend using it. It’s more reliable. But since not all devices support TCP, we will configure our syslog-ng with UDP in the following examples. Step one: Configure your device to forward logs to syslog-ng on server 10.1.1.128. Step two: Edit file /etc/syslog-ng/syslog-ng.conf and add the following content. 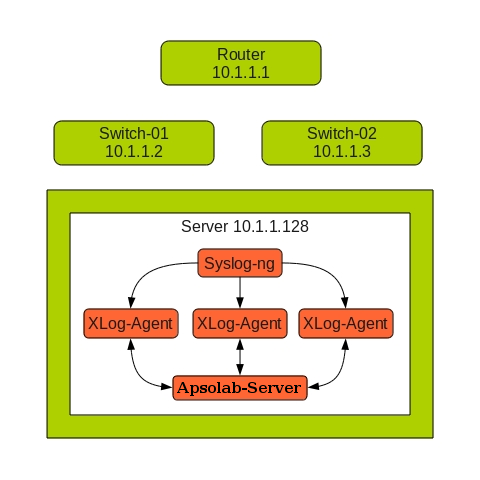 You can connect syslog-ng with Apsolab-Server without using XLog-Agent.